One of the many beauties of cruise travel is that passengers only have to unpack once, but get to visit many places. This is especially true in the Caribbean, where varied islands and ports of call are typically within one or two nights sailing of one another. With so much to choose from, smart cruise travelers make the most of each day on a Caribbean island. Whether that means simply staying aboard the quiet ship while a majority go ashore or planning a unique outing no organized shore excursion could match. One place to optimize a port call is Puerto Rico's capital, San Juan. Ships have been heading into San Juan Bay since the days before Columbus and it's culture is a blend of Spanish, African, and Taino cultures, mixed with a U.S. way of doing things. An exploration of Old San Juan starts at the pier. Its ideal for exploration by foot, with walks ranging from a few blocks to a few miles. Theres also a free trolley (take the Northern route to see Old San Juans history or take the Central or Puntilla routes to go shopping). Most cruise ships dock on the protected southern side of Old San Juan, right on Paseo Gilberto Concepcion de Gracia. To the left, the yellow building with the fountains out front has a helpful Tourism Information Center, called La Casita. Maps, brochures, and more will make an exploration of Old San Juan even easier. The huge City Wall surrounding much of Old San Juan is an ever-present part of the city. Begun in the 1630s, it features two 42-foot-high parallel walls that were built out of solid sandstone blocks and held together by mixtures of mortar, limestone, and sand. The city's fortifications are a highlight of a visit to the Caribbean. The Spanish started building the fort in 1540 and didnt really complete it until 1786. Rising 140 feet above the sea, El Morro is as formidable to tourists today as it must have been to ships approaching it centuries ago. Errol Flynn knew an exciting island activity when he experienced it--and he experienced it on Jamaicas Rio Grande. Though thousands of visitors have been rafting down the Rio Grande in Flynns wake and the put-in can sometimes look like a bamboo raft parking lot, this adventure doesnt feel very touristy once the rafts spread out on the river. Rafters see plenty of fauna and flora, as well as experience a side of Jamaica thats different from the bustling beaches and shopping areas. The adventure typically begins at Grants Level, which is about six miles north of Port Antonio. Here, rafters board the two-person bamboo rafts for two- to three-hour trips downstream to the take-out at Rafters Rest. The licensed and experienced raft captains can make the trip even more enjoyable, thanks to a wide array of knowledge about local plants, animals, people, and history (and most of it is true). 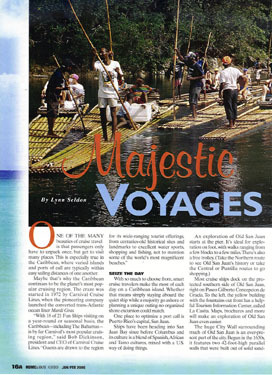 Positioned at the front of the raft and typically barefoot, they guide the raft down the river, using the current to move the raft and a pole for pushing off the bottom. The languid trip down is typically accompanied only by stories from the guide, the murmur of the Rio Grande, and some riverside crafts, souvenir, and Red Stripe salespeople. However, the lush view from the raft's throne-like seat is enough of a souvenir for most people to take home. To many cruise ship passengers, Grand Cayman means famed Seven Mile Beach, swimming with stingrays, or a visit to the Turtle Farm at Boatswains Beach. However, those in the know often head to Rum Point for something a bit different. First documented on a 1773 map, Rum Point is now a complete beach destination far from the crowds of bustling George Town or Seven Mile Beach. It features everything a beach-goer could desire: a quiet beach; clear waters; cold drinks and local food (The Wreck Bar is a Rum Point Landmark); and practically any beach activity one could want, including snorkeling, a glass-bottom boat trip, water toys, or a nap in one of many shady hammocks). Though some cruise lines do offer shore excursions that include time at Rum Point, its also easy to reach independently. Taxis await dockside in downtown George Town and can whisk passengers to Rum Point in less than an hour. Though the price might be steep for one person, the taxi fare goes down for each additional person (and a discounted return fare can often be negotiated in advance). Taking a taxi also provides some flexibility for stops along the way or on the way back. For instance, Queen Elizabeth II Botanic Park beckons with 65 acres of Caymanian flora, fauna, history, and beauty. The Mastic Trail offers another natural diversion. Once a route of commerce before roads were built, the two- or three-hour (out-and-back) trail passes through mangrove swampland, palm savannah, and rocky outcroppings. For scuba divers, Cozumel is a world-class underwater wonderland. For non-divers, the island is the perfect place to visit the underwater world for the first time, thanks to excellent introductory instructional courseS. What draws the diving crowd is the wall that drops off its western shore. A steady current running from the south brings in fresh nutrients and sea life, making each dip special. The gin-clear waters usually offer around 100 feet or so of visibility and common marine life sightings include huge groupers, black corals, giant sponges, moray eels, and much more. Cozumel's residents welcome divers with open arms. The locals and dive shop employees are incredibly friendly. Though Spanish is the official language and tourist attempts at speaking it always appreciated, English is spoken throughout the island. Downtown San Miguel is the place to head during topside time. The bustling town square is the best base, and weekend fiesta celebrations are quite common. A popular hangout is Carlos 'n Charlie's, where Mexican fare, cold cervezas, and entertainment are all good-time traditions. The Bahamian island of New Providence means Nassau to most visitors, and a stroll through Old Nassau provides a slow-paced exploration of a relaxed capital. The best place to start a walking tour is at Rawson Square and the Ministry of Tourism Reception Services Office for maps and helpful information. Rawson Square is at the foot of the Prince George Wharf, where cruise ships dock. The squares main feature is the Churchill Building, where several government officials have offices. Theres also a statue of Sir Milo Butler, the first governor of The Bahamas after the islands gained independence in 1973. The waterfront walkway to the west is known as Woodes Rogers Walk, the street named for the first British governor of The Bahamas. It eventually leads to the infamous Straw Market. Before heading that way, look for Parliament Square just behind Rawson Square. This busy square includes a statue of young Queen Victoria, as well as the Senate Building, the House of Assembly and the Supreme Court. Some of these buildings date from the late-18th century, with the House of Assembly building housing the oldest continuing government body in the New World. A trip along Woodes Rogers Walk leads right past the Junkanoo Expo. This fascinating museum is well worth the small price of admission. Inside, visitors find colorful costumes, masks, and much more from past junkanoo--popular festivals marked by colorful characters, music and parades. Then, it's on to the Straw Market--much more than just handmade straw souvenirs. It's a unique shopping experience, where visitors find a cornucopia of color and atmosphere. After Parliament Square and the Straw Market, the rest of Old Nassau seems much more subdued. Behind the Straw Market at George and Bay Streets, look for the Vendue House and the Pompey Museum. This 18th century building served as a slave market until the Emancipation Act of 1834. The house is named after the slave who lead a revolt, and the museum houses exhibitions about Bahamian culture and many fine paintings by well-known Bahamian artist, Amos Ferguson. Up Market Street from the Straw Market is Balcony House, which was built by ships' carpenters in the late-1700s. It now houses an interesting local museum, a staircase from a ship, slave kitchens, and three other historic houses. Farther up Market Street, Gregory's Arch spans the road. This pretty arch, built in 1852, marks the entrance to Grant's Town, one of the earliest settlements of former slaves. Nearby, you can take a peak at the pretty pink Government House and marvel at the Christopher Columbus Statue, which has been there since 1830 and commemorates the New World arrival of Columbus in The Bahamas. Heading east on Shirley Street, be sure to stop by the little Nassau Public Library and Museum and the nearby quiet grounds of the Royal Victorian Gardens. The octagonal library was once the islands jail. At the corner of Elizabeth Avenue, the National Historical Society Museum provides one of the best historic overviews of The Bahamas. The exhibits traces the history of The Bahamas from pre-Columbus period to the present. After visiting the museum, take a right on Elizabeth Avenue and head up the Queen's Staircase. These steps were carved out of limestone by slaves for a quick route to Fort Fincastle, built in 1789, on the top of the hill. Each of the 65 steps supposedly stands for a year of Queen Victorias reign. In spite of many cruise passengers stopping in St. Thomas, U.S. Virgin Islands, its neighboring island of St. John remains a secret spot of natural beauty. For the price of a short ferry ride either from downtown Charlotte Amalie or nearby Red Hook, St. John offers some of the best hiking in the Caribbean. Ferries dock in Cruz Bay, which is also the location for the headquarters and Cruz Bay Visitor Center of the Virgin Islands National Park. Roughly two-thirds of St. Johns 19 square miles is protected as national park land. Twenty-two self-guided hiking trails will take visitors into the isle, where they can find ancient petroglyphs, lush foliage, stunning views, and even a secluded beach for a refreshing post-hike dip. Many trails lead right out of Cruz Bay, while others are easily reached by public transportation.